So, July 2013 was an interesting month for us. First, my wife (Margaret) and daughter (Miranda) spent the entire month in Alabama. Miranda wants to be a veterinary technician, and she had an opportunity to work at her grandfather’s former veterinary clinic in our hometown in Alabama. So, Margaret took her down so that she could work at the clinic through the month of July. Unfortunately, my son (Jeremy) and I had to stay in North Carolina to work. Needless to say, we missed them very much. 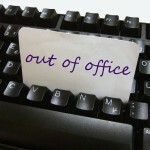 On top of that, I have been extremely busy with my job, including a business trip for a few days in July. Plus, we had to complete some certifications during the month of July for another contract. Saying that about my job, I need to tell you… I really love my job! I’ve said that a few times here, and it’s more true now that it ever has been. My responsibilities are changing, and I’m excited about the direction that both my company and my job are heading. 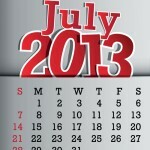 Of course, everything that happened during the month of July affected my ability to blog. So, I did not blog for several days. Also, I’ve been thinking about the best way to describe my understanding of the church (i.e., my ecclesiology). I’m planning to publish a brief post about that tomorrow. Well, that’s the personal update from here. How are you doing? I talked to a few church leaders, and I was given two options: God was either calling me to be a vocational pastor or a vocational missionary. Obviously, there were different jobs (“callings”) within those two options, but everything fell within those two divisions. After much prayer and counsel – and deciding that God was not calling me to go overseas – I decided to go to seminary to prepare to become a vocational pastor. 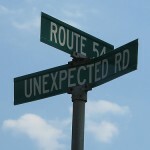 I’m glad that I made that decision, even though the outcome is not what I expected. I am not a vocational pastor, and I do not intend to become a vocational pastor. Instead, one thing I’ve learned over the last few years is that there is another option: the non-vocational option. More and more people are beginning to understand both the scriptural precedence for and the practical benefits of serving others in a “non-vocational” manner – that is, serving others without being a vocational pastor or minister. For example, see the Washington Post article from May 2013 titled “Seminary graduates not always ministering from the pulpit.” By the way, I’m not suggesting that you must be a seminary graduate to serve others. This article simply shows that even many people attending seminary are beginning to recognize the benefit of “non-vocational” service. Recently, while speaking with a friend, he reminded me about a conversation that he had with a mutual friend a few years ago. Our friend was a seminary student, and had plans to become a vocational pastor. He was beginning to understand this different view of serving others, but didn’t know what he was going to do. He only had Bible school training and didn’t know how he was going to support himself and his family if he did not have a job with a church. Lately, not only have I learned that God can use someone who works a “full-time secular job,” I’ve also been able to help others who want to transition away from a “full-time vocational ministry job.” Through this, we’re all learning that there are many benefits both to the individual and the church from serving others while also working a full time job (that is not a church job). Hopefully, God will continue to provide opportunities for me to encourage others into this non-vocational option, and even continue to help them find jobs that provide for themselves, their families, and others – much like Paul encouraged the Ephesian elders to do in Acts 20:33-35. 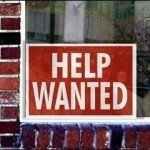 What benefits do you see for individuals in being non-vocational servants instead of vocational pastors/ministers? What benefits do you see for the church? Are there any disadvantages? I should be able to begin normal blog publishing toward the end of this week. Margaret (my wife) and I woke early Sunday morning – before 5:00 a.m. in order to get ready and make the drive into downtown Raleigh. 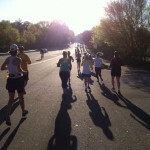 We were headed for Cameron Village and the start of the RunRaleigh half marathon. I’ve run several half marathons, but this one was a little special. What made this one special? Well, I ran a marathon for the first time about a month ago. I registered for this race for several reasons but mainly because I wanted to have motivation to keep running after that marathon. It was still dark when we found a parking place very near the start/finish line and made our way to another line: the line for the porta-potties. It’s always fun to maneuver in a porta-potty in the dark. Then we got together with some friends who were running the same race, snapped a few pics, and watched the sun and excitement rise. Eventually, it was time for the race to start. I made my way to the starting line while Margaret found a place just down the road to watch the start… and to cheer for me as I ran by. The race itself was (believe it or not) a very relaxing event for me. Like I said, I primarily registered for this race as a motivation to keep running after the marathon last month. I ran slower than usual and just enjoyed the sites, sounds, and conversations. Conversations? Yep. I ran with a pace group, and enjoyed talking to several other racers on the 13.1 mile course. It turns out that the pace leader is the race director for another half marathon that I’m running next month. 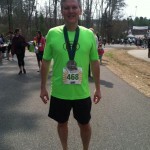 He runs ultras (greater than marathon distance – that is, > 26.2 miles), so he offered alot of advice and encouragement. And, there were two ladies who were running a half marathon for the first time. So, I was also able to add a little advice and encouragement. During the race, we watched the sun rise higher in the sky and passed several local landmarks and streets. We passed many cheering spectators, and I saw a part of Raleigh that I usually don’t get to see. Well, I said the race was relaxing… it was, except for that last hill. That was tough… brutal even. But, I made it! It was so exciting to top that hill and see a long downhill to the finish line. As I approached the finish, a friend yelled my name. I’ve run trail with him before. He was standing about a block from the finish with his two boys cheering for his wife who was also running. Then, just past him, I saw Margaret. She was smiling and waving and snapping pics! Ok… so I picked up my pace a little at that point. Across the road from Margaret was a group of running friends who had finished the race before me or who did not run but had come just to cheer on other runners. They were also yelling my name and cheering me on to the finish. With all of that encouragement, I’m not sure my feet touched the ground those last few yards. When I crossed the finish line, they placed a finisher’s medal around my neck and gave me a bottle of water. I found Margaret in the crowd and she gave me a huge hug and told me how proud she was. We walked over to my friends, and we all congratulated each other and cheered on other runners as they approached the finish line. I was tired, sore, and happy. It was such a fun, exciting, exhilarating, thrilling morning… It was a celebration with other runners, family, and friends. I just thought you might want to know what the people (racers and spectators) were experiencing when the bombs exploded at the finish line of the Boston Marathon yesterday. Google Reader is dead. Long live Feedly! In case you haven’t heard, Google is killing Google Reader on July 1, 2013. That’s only a couple of months away. If you’re like me and use Google Reader daily to keep up with many (too many) blogs, then this news may have come as a shock. I received several suggestions and looked a few briefly. Then, I tried Feedly, and I LOVE IT! Seriously. In fact, I think I like Feedly better than Google Reader. If Google announced today that they changed their mind about killing off Google Reader, I would not change back. If you use Google Reader, I’d recommend looking into Feedly. Feedly will automatically sync to your Google Reader account, and you will not have to do anything to pull in your RSS feeds. If you decide to try it, let me know what you think. 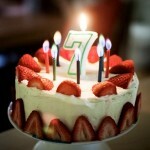 I started blogging seven years ago on March 21, 2006. On that day, I published two different posts: “Welcome!” and “Questions.” I wrote very sporadically for the next few months, writing about 80 posts through the middle of November. Then, beginning in November, I begin publishing posts regularly. Since that day seven year ago, I’ve published over 4,000 posts. But, to be honest, that’s not very impressive to me. If this site was nothing more than 4,000 posts that I had written, then I would have stopped publishing this blog a long time ago. Why do I keep publishing posts for this blog? Because of the 26,000 comments that have been left on this blog since I started it seven years ago. 26,000! That’s more than 10 comments per day average. And, that’s one of the main reasons that I keep writing and publishing posts here. The comments and interaction and discussion that happens here are more important to me than the posts themselves. So, in the blogiversary post, I want to say, “Thank you!” I continue to enjoy blogging because of you. Thank you for reading; thank you for commenting; thank you for emailing; thank you for anything. You are amazing! You are the reason that I continue to publish this blog seven years later. Yesterday, I ran a marathon for the first time ever! In fact, before yesterday, the longest distance I’d ever run was 18 miles. Now, I won’t lie to you and say that everything was wonderful during the marathon. It wasn’t. The first half went great, but the last half was a real struggle. While all marathons are difficult, I think I struggled with the last half of this one because my training routine has been hampered the last few weeks because of sickness and a few other things. But, I did finish, which is a huge accomplishment for me. I still prefer the half marathon distance, and I’ve already registered for another half marathon next month. But, for now, I’m not counting out the possibility of running another marathon sometime in the future. Here we all were around the table, talking about what it was like for Jesus to wash the feet of his disciples and what the modern equivalent would be. The beauty of this conversation was how everyone contributed something profound, even if Kat and Jo still barely knew their way round the Bible and Kat in particularly was still finding reading difficult. Her insights were just as welcome and profound as anything Rob or I came up with. How awesome it is when brothers and sisters gather together to share a meal and to encourage one another in Jesus Christ! Expository discussion is based in the idea that the church is a fully functioning priesthood of all believers. All Christians have the ability to read and understand what God has said. Some may be more experienced at this process, but all can and should participate. Since all have the ability to read (or at least listen to) scripture and discuss it, the group dynamic is often a fascinating one. In a room with, for example, twelve people, the group can benefit greatly by what the Holy Spirit has to add through all twelve people. While the biblical text means one thing, the group has a way of seeing and describing that one thing is different ways. This helps all involved better comprehend both what God means and how they should respond to this. Eric is describing something that I call a “community hermeneutic” or “community interpretation.” Like he says, it is quite fascinating to participate in and extremely edifying. Finally, Chuck at “Being Filled” wrote a post called “Consider Others Better Than Yourself.” Chuck wrote this as part of a “chain blog” on the topic of “One Another” that we started back in October 2012. [T]his means that we should be very slow to judge intentions. When someone does something we don’t like, it is easy to imagine a malicious intent behind their actions. We ought rather to always give the benefit of the doubt. Assume a person’s intentions are pure unless proven otherwise. So, that’s all the news for now. I’m resting my legs after running 26.2 miles yesterday, and enjoying even more of the wonderful blog posts out there that encourage the church of Jesus Christ to build up one another in love, faith, and unity. Since I drive to my office pretty early those three mornings (early for me, anyway), I’ve decided to use the fitness center in our building before work. I work in one suite of an business park that includes several shared areas including a deli/grill, restrooms, and a fitness center. Then, after hitting the weights for a few minutes, I shower and get ready for work (in the shared restrooms). A few days ago, after showering and dressing and while shaving. A man came into the restroom with me. I had seen this man around before. He didn’t dress as nice as most of the people in the building. (Most of us don’t wear suits, but we also don’t wear dirty coveralls either.) I decided that I would speak to him. Surprisingly, he took his hand off the door handle and turned back toward me. He told me that he did not work in the building, but that he was a subcontractor who did alot of work for the owner of the building. I told him that I thought I had seen him around before (which was true), and he said that he had done several jobs for this lady. For the next couple of minutes, I learned quite a bit about this man. I learned that he really likes working for the lady who owns the building that I work in. I learned that he would do contracting work for her all the time if she had enough work. I learned that the most of the business owners around that area are not very nice to subcontractors. I told him it was nice to meet him, and he smiled and walked out of the restroom. I’ll probably see him around the building again… and I’m looking forward to it. 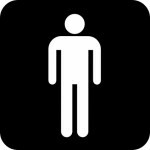 Apparently, it’s possible to start a relationship with someone by breaking a taboo and speaking to a stranger in the men’s restroom. Occasionally, I’m invited to spend some time with a group of believers in a different city. Until recently, primarily because I was having to work several parttime jobs, I had not been able to accept any of those invitation. However, recently, I’ve been invited to gather with a group of brothers and sisters in the Charlotte, NC area. My friend, Leah, is organizing this get together, and she’s inviting several people to join these believers to encourage them in their walk with Jesus and their walk with each other. I’m excited about this time together, because the focus is on expectations. I’ve talked with several people recently about expectations, and I think this get together will work well with what I’ve been learning lately. In particular, this gathering is being put together for those who are seeking fellowship in Christ but are struggling to find it. While there are many different reasons that this could be the case (and I’ve written about them previously), I’ve found that expectations play a big role as well. 2) It will be extremely relational and interactive. 3) I will probably learn as much as anyone else. I’ve decided to write about expectations over the next few days and how these expectations might affect our ability to fellowship with others. I look forward to your input on this topic. If you’re interested in joining us that day, let me know, and I’ll send you more information. You can leave me a comment here or email me at alan [at] alanknox [dot] net.